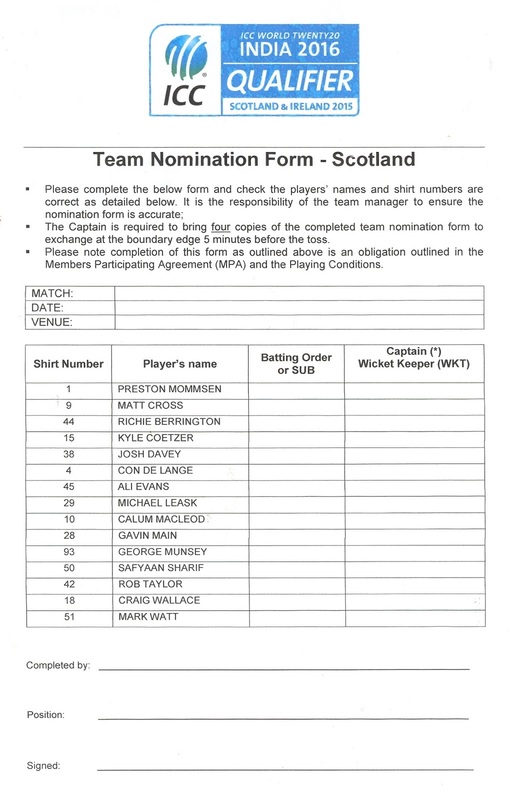 One of the groups for the qualifying tournament for the 2016 T20 World Cup, to be held in India, took place in Scotland in July 2015, and this match was the host’s final one in the pool. Oman sat atop the table at the start of play, and a win for the chaps from the Sultanate would guarantee a trip to the subcontinent the following year. Scotland, with a victory could in theory finish top and pinch that automatic place, but for this to happen would also require other matches to go their way. Kyle Coetzer and Calum McLeod opened the batting for Scotland in a hurry, the former hitting boundaries from both the opening two balls. Good start, I thought. But what really caught the eye during those early exchanges was markedly contrasting, yet equally odd, techniques the two opening Oman bowlers utilised. Pace bowler Munis Ansari appeared to bowl side-arm I suppose you would call it, almost whipping his arm across round his body. To me it looked like nothing so much as a good old fashioned chuck, but I suppose someone must have thought it was OK. Spinner Zeeshan Moqsood by contrast was clearly a chap not prone to expending any more energy than absolutely necessary. For he just took a couple of languid slow-motion strides to the crease before letting fly. And the sight of that ultra casual run-up, reminded me of an incident from forty-odd years ago which I had almost complete forgotten. Back when I was at secondary school, PE or gym pretty much meant fitba. Every week. But I have a recollection of a short spell where the classes were split up into smaller groups, and each group given a different sport to attempt to get to grips with. Thus it was around a dozen or so of us were presented with a cricket bat, a ball and three stumps (no bails), and compelled to wander out onto the spacious school playing fields to claim a spot where we could teach ourselves the finer points of cricket. Bullies were so thick on the ground at my school that any clutch of a dozen kids chosen at random would inevitably contain at least one such. And so it proved – our group sporting a particularly thuggish and spiteful Neanderthal. He promptly commandeered the bat – perhaps thinking his non-sporting experience with a baseball bat represented a transferable skill – and ordered the rest of us skinny weeds to bowl. Not really having the remotest clue how to do this properly, we began just pretty much tossing the ball in his direction for him to thwack it towards the horizon, whereupon one of us would trot off and collect it, and repeat the process. Just when it began to look as if this procession would go on for the whole hour of games, into the picture stepped a scruffy elderly figure who had been eyeing proceedings from afar – to whit, the school groundsman. I don’t think I ever knew his real name but, what I do recall is that, on account of his thick glasses and the fact he always wore wellies, he was known (behind his back) as Goggsley. I am not quite sure how much ground-keeping he actually did, his prime role being more of a scarecrow really; given he lived locally and would regularly chase us oiks off the pitches in the evenings and at weekends. He was regarded as more a figure of fun though, rather than any form of threat. Just some elderly duffer topping up his pension, as far as we kids were concerned. Eventually he diffidently asked if he could have a bash at bowling, and still attired in bottle-bottom glasses and wellington boots (and in a manner not dissimilar to the aforementioned Mr. Moqsood), he casually strolled up and bowled at our batsman-in-residence. But as Biffa Bacon stepped forward to whack the thing into the distance, as he had done with pretty much every other he had faced, the ball took a wicked spin off the ground and sent the wickets flying. Us would-be bowlers just stood open-mouthed in awe, whilst bully boy stared at his nemesis with a look of disbelief and fury on his face in equal measures. Our new hero declined the offer to bowl again, and just sloped off with an oddly enigmatic smile on his face. Clearly our Goggsley was a chap with an interesting back-story, which we never even suspected. Peculiar bowling actions apart the Omani attack never really got to grip with the home batsmen and, with Scotland rattling along at a rate of ten an over for the first half of their innings, the runs soon mounted up. The rate dropped a touch once the big hitters were gone, but Scotland eventually posted a rather impressive target of 173. Given Oman’s previous totals in this competition had been a remarkably consistent 136, 135, 138 & 144, to up their game to reach 174 appeared a tall order. They began, as Scotland had, with a boundary off the opening ball, but even before losing two wickets in successive balls in the tenth over, Oman had dropped way behind the required run rate. Aamir Kaleem dug out an admirable 59 - hitting three sixes in the process - before being bowled by Safyaan Sharif, but even he endured long spells where he just could seem to even hit the ball. Oman were eventually finished on 150-7, some 24 runs short. We later learned that with the rain at Stirling preventing Afghanistan’s match from taking place, along with Kenya’s unfathomable collapse against Netherlands at Myreside, Scotland had, rather improbably given their start of play situation, qualified directly for a trip to India by topping their group. Quite an achievement, I suppose. As for Oman, they would have to travel to Dublin later in the month for a play-off against either Namibia or Netherlands to see if they could join Scotland. The glum Omani camp, as they realise the match is drifting away from them. achievement for me as capturing a wicket fall. ...but fails to deal with this one. For part of the Omani innings I sat at the boundary, from where home fielder George Munsey occasionally exchanged words with a couple of folks (?relatives) sitting next to me. Noting he spoke in a distinctly un-Caledonian accent, it did set me to wondering just how many of these players I was here supporting were actually Scots. I am quite sure all qualified under whatever lax criteria is in place these days, but how many I pondered had taken their first breath on these shores. Well, precious few if Wikipedia is to be believed. Just four of today’s eleven, in fact; with three of those (Matt Cross, Josh Davey and the frankly Afrikaans-sounding Kyle Coetzer) hailing from Aberdeen. Of the rest, three were South Africans, with the remainder (including the rather well-spoken Mr. Munsey) born south of the border. I suppose such a regretful state of affairs is probably inevitable given the shallow pool of home-born cricketers the national selectors have to choose from. 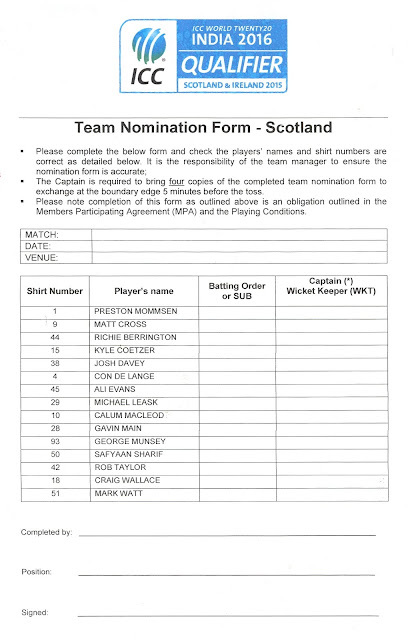 Furthermore one has to wonder if there is even any point in investing in producing more quality home-grown talent given, as Ireland have found out to their cost with Eoin Morgan and Boyd Rankin, any truly talented individuals would in all probability swiftly end up pulling on an England jersey.